The death toll from September 22's stampede during a Hajj ritual, the Stoning of the Devil, outside of Mecca, has risen to 769, Saudi Arabia's health minister announced on September 26, 2015. 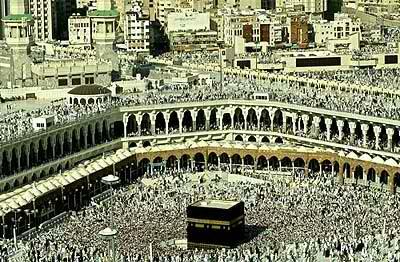 Saudi officials said a total of 13,74,206 foreign pilgrims arrived for Hajj this year. Thousands of Muslim pilgrims stone the walls, in a ritual called "Jamarat," symbolizing the stoning the devil, in Mina near the Saudi holy city of Mecca. 2015: Officially, 769 people are killed and more than 800 injured in a crush of pilgrims on September 22, in Mina, on the outskirts of Mecca. 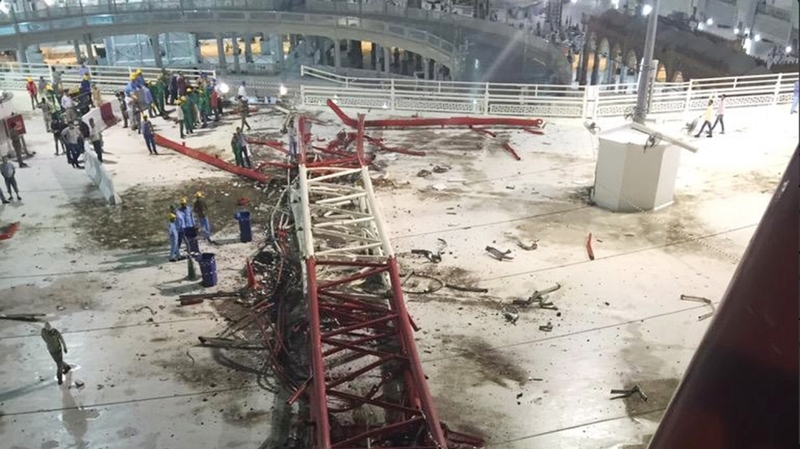 2015: On September 11, 2015, a crane collapses in a storm and crashes onto the Grand Mosque in Mecca, killing 111 people are killed and injuring nearly 400. 2006: More than 360 pilgrims are killed in a stampede in Mina, near Mecca, where pilgrims carry out a symbolic stoning of the devil. A day before the Hajj begins, the collapse of an eight-story building used as a hostel near the Grand Mosque kills 73. 2004: A crush of pilgrims at Mina kills 244 people and injures hundreds on the Hajj's final day. 2001: A stampede at Mina on the final day of the Hajj kills 35 people. 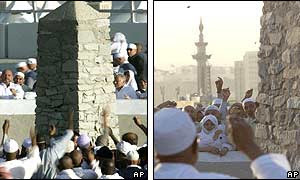 1998: About 180 people are trampled to death in panic after several of them fall from an overpass during the stoning ritual at Mina. 1997: At least 340 pilgrims are killed in a wind-whipped fire at a tent city in Mina. 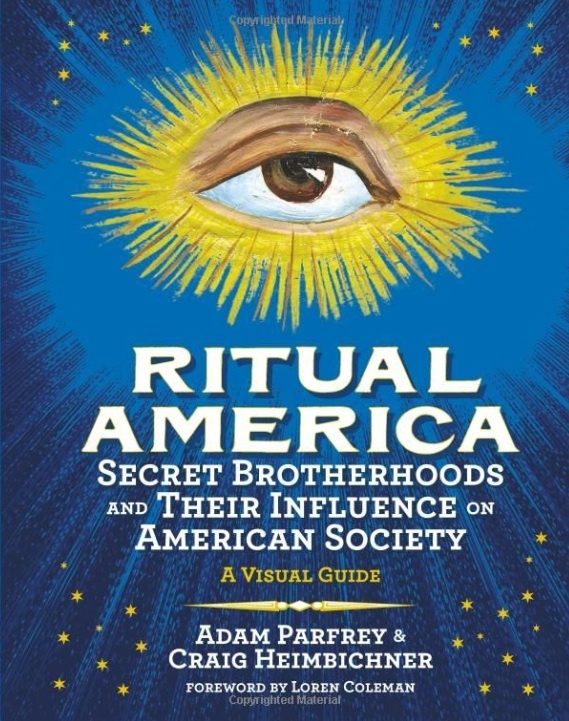 More than 1,500 are injured. 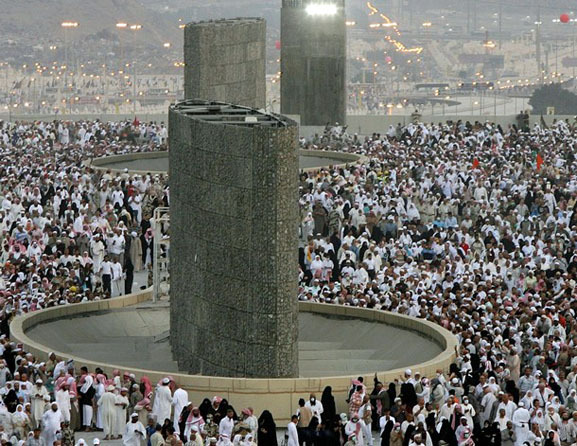 1994: About 270 people are killed in a stampede during the Mina ritual. 1990: A stampede kills 1,426 people at an overcrowded pedestrian tunnel leading to the holy sites in Mecca in the worst Hajj-related tragedy. 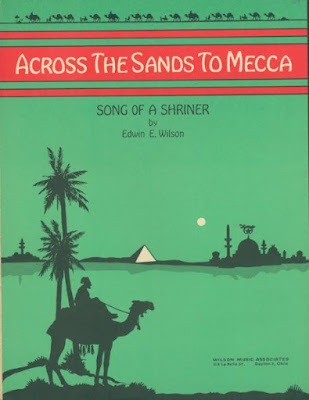 Across the Sands to Mecca: The Song of a Shriner (1947) book cover (from the Freemasonry's Shriners) is courtesy of Adam Parfrey, coauthor of Ritual America. 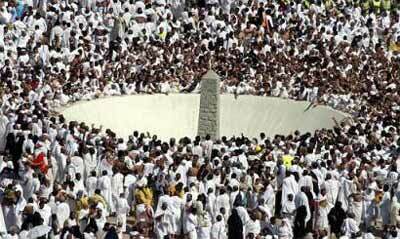 Officially, 769 people are killed and more than 800 injured in a crush of pilgrims on September 22, in Mina, on the outskirts of Mecca.